they are a truly nutritious snack food alternative. 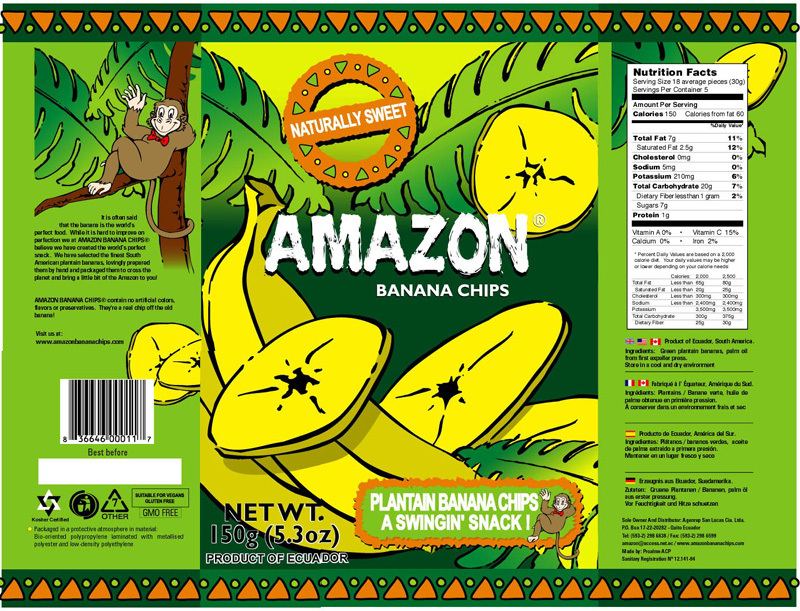 Amazon Banana Chips® are made from the highest quality plantain bananas grown in the tropical coastal areas of Ecuador, which are sliced and fried in palm oil to produce tasty banana chips. 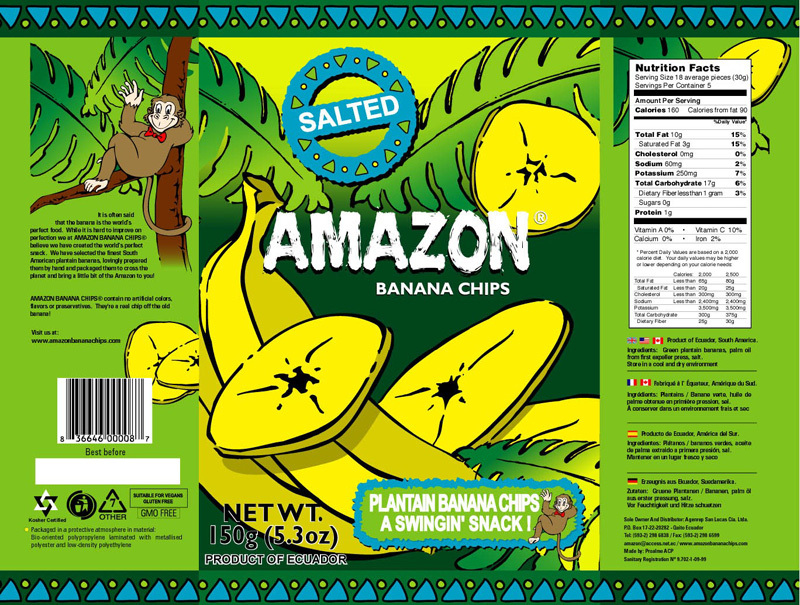 Amazon Banana Chips® has its own unique taste and when seasoned with natural salt or spices, makes a delicious savoury snack. 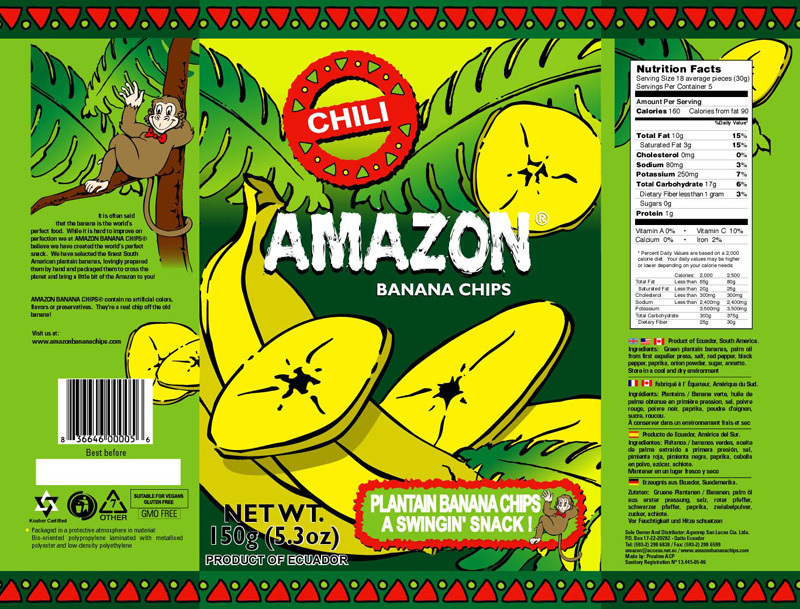 Amazon Banana Chips® are produced in a state of the art manufacturing plant located just outside Ecuador's capital city of Quito using the latest technical advances in food production. We maintain our high standards by subjecting each chip to rigorous quality control before we allow it to be marketed under the Amazon brand name. Amazon Banana Chips® has developed its own blend of natural seasonings for each of its products. Our current list includes Natural (no seasonings), Salted, Chili, Black Pepper, and Naturally Sweet. The product is available in 50g and 150g bags, as well as 1kg bulk packs. Free from artificial colours, flavours and preservatives, Amazon Banana Chips® are made from all natural ingredients compatible with a healthy diet, with a good source of potassium and cholesterol free. Whats more, Naturally Sweet Banana Chips have no added sugar or artificial sweeteners. Shipping from Ecuador to the rest of the world couldnt be easier. Order a 40 High Cube or a 20 container and Amazon will take care of everything. Amazon Banana Chips® provide an exciting tropical alternative to the usual snack foods that line our supermarket shelves. They are already in high demand. Simply contact us and our multi-lingual staff will be happy to help you with any query.